En Universal's Islands of Adventure, el popular libro de Dr. Seuss "How the Grinch Robó la Navidad" escobra vida en Grinchmas, un show en vivo con la partitura musical original de Mannheim Steamroller. Durante el espectáculo, seis temas son interpretados por un elenco en vivo, incluyendo el Grinch y los Whos de Whoville. Como parte de la celebración Grinchmas, los huéspedes también tendrán la oportunidad de reunirse con el Grinch. When the holiday season hits full swing, Universal's Islands of Adventure® will transform its Seuss Landing™ area into the whimsical world of Grinchmas™. Be sure to explore every nook and cranny of this wintry wonderland, as it's filled with special touches Dr. Seuss fans are sure to adore. 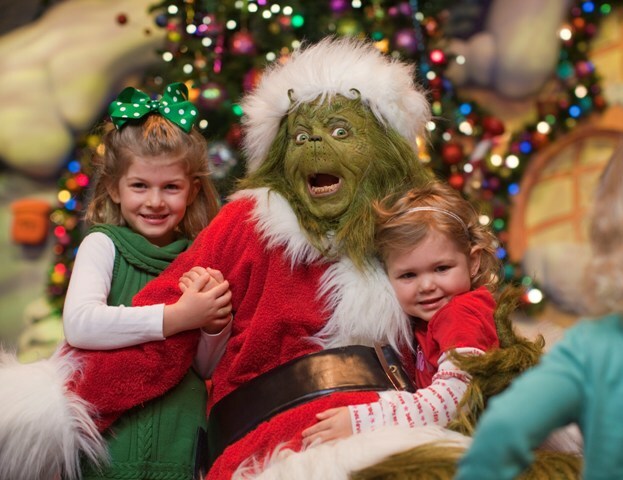 Who wouldn’t want to reminisce about their heartwarming moments meeting The Grinch™? Alright, perhaps "heartwarming" isn’t the right description. Maybe "hilarious," or "spectacularly sarcastic?" Either way, this is your chance to get his autograph, shake his furry hand, and have your photo taken with him. It’s the perfect memento for those who like to do holidays their own way. As part of Grinchmas™ at Universal’s Islands of Adventure®, enjoy a delicious breakfast to start your day of Holiday Cheer and meet The Grinch himself! Choose from a menu of breakfast entrée options including Green Eggs and Ham Platter, Continental Fruit and Yogurt Platter; All-American Platter; Pancake Platter; and Combo Platter with pancakes, sausage, bacon, hash browns, croissant, and eggs. (All platters are available in adult and child portions).